I found this at the back of the ‘drinking cupboard’ – the cupboard reserved for wine slated for drinking at the next available opportunity. I can’t remember when the hell it got in there but it was obviously some time ago because I have no idea where it came from and it was all dusty. A ruby, brick red colour, it attacks nervously with varnishy, charry oak, before settling down to flaunt fruit aromas of black plum, dark cherry and redcurrant. There’s typical pepper – black and white – licorice, chocolate, mocha, and some lovely aromatics of lavender and lanolin. On the savoury side there’s dark meats, mushroom and scorched earth. Medium bodied, the oak is strong (and French I think) but doesn’t tip too far. On the palate it is equal parts murky dark and clean vibrancy, still exhibiting primary fruit flavours. Black plum and cherry again, pepper, and add blackberry and christmas cake to the list. Still a grippy wine, and taut, until an hour or two of air when it begins to fully open and express itself. Enjoying it still as it continues to evolve in the glass. It still feels like a baby and makes me wonder how many of these styles of wines are actually cellared appropriately, given their release dates of some years earlier. 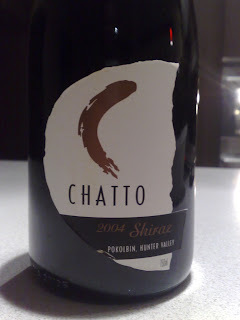 Producer: Chatto Wines – Jim Chatto’s own label established in 2000. He now works for Peppertree as far as I can tell. Not sure if he’s still making wines under Chatto label. Anyone? Site: 40 – 50 year-old vines. Vintage: A mild lead-in to vintage until a heat spike in Jan/Feb. Late Feb rain stuffed a few producers but those who picked before the deluge were rewarded. I appreciate you for your dream- work put together in this blog, keep it up.